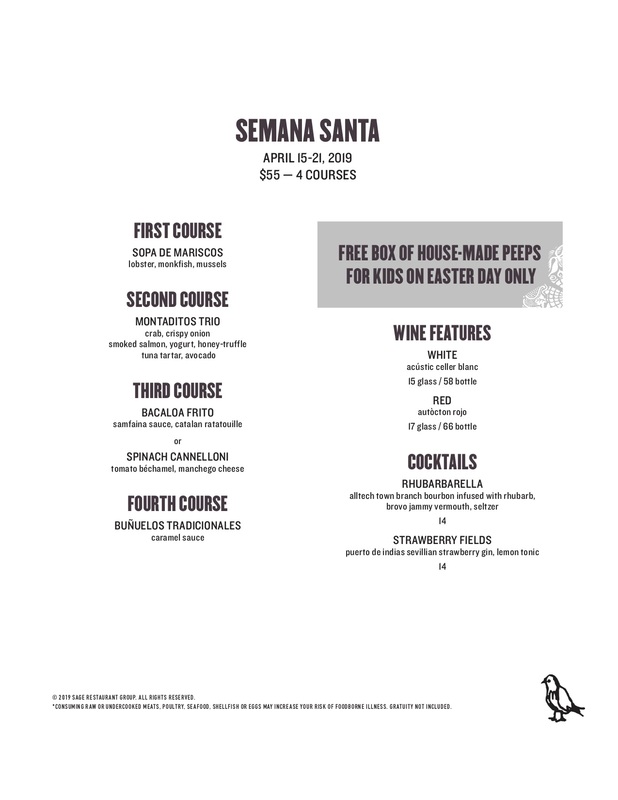 The South Loop restaurant celebrates Easter with a four-course menu inspired by Spain’s Holy Week or Semana Santa. First course includes a Spanish Bisque with lobster, monkfish and mussels; second course includes a Montadito Trio featuring crab, smoked salmon, and tuna tartar. For the third course, guests have their choice between an Atlantic Cod Tempura dish with samfaina sauce and Catalan ratatouille or a Spinach Caneloni dish with tomato béchamel and manchego cheese. Guests finish dinner with Traditional Easter Beignets served with caramel sauce. Kids receive a free box of three Housemade Peeps in the colors of Spain’s flag on Easter Day. The menu is available April 15-21 and is priced at $55.